85% occupancy, thursday, july 11, 915am. 28 of 33 non-handicapped spaces occupied. A big improvement in usage from previous observations a year ago! This may bode well for the future parking at the new mbta lot. My name is Max Jacobson and I go to Northeastern University. 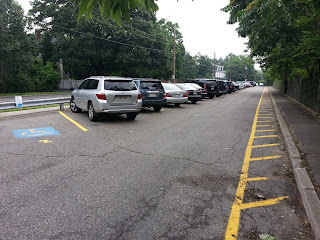 I would love to talk to you about the current parking situation in Newton, specifically Newton Centre. My email address is jacobson.ma@husky.neu.edu. If you could email me, it would be great. Thanks.